Jodie Meeks’ 10-Day Contract Expires; Raptors Seeking Frontcourt Depth? Jodie Meeks‘ 10-day contract with the Raptors has expired and the team is unlikely to renew it, tweets TSN’s Josh Lewenberg. Toronto has two weeks to add a 14th player to its roster to meet the league minimum. Meeks, 31, appeared in two games for the Raptors during his 10-day day, averaging 7.5 PPG and 2.0 RPG in 12 minutes per contest. After having not appeared in an NBA game since last season, the veteran shot a strong 37.5% from beyond the arc. While Meeks had a solid showing, Toronto may seek frontcourt depth despite the acquisition of Marc Gasol, Lewenberg tweets. He mentions former Wizards center Marcin Gortat as a possible target, adding that there’s “mutual interest” between the two sides. In 47 games with the Clippers, Gortat averaged 5.0 PPG and 5.6 RPG. To be playoff eligible, players had to be waived by their previous club ahead before March 1, so Gortat would qualify if he signs with a new team. The Bucks have talked about signing former Clippers center Marcin Gortat, but no move will be made right away, tweets Marc Stein of The New York Times. Sources tell Stein that Milwaukee’s interest hasn’t progressed past the discussion stage. L.A. waived Gortat at the trade deadline to open a roster spot so the team could complete a trade with the Grizzlies for JaMychal Green and Garrett Temple. Because he was released before today’s deadline, Gortat would be playoff eligible for anyone who picks him up. The Clippers acquired Gortat in a trade last summer, hoping he would help make up for the loss of free agent center DeAndre Jordan. However, Gortat got off to a slow start and wound up averaging just 16 minutes per night in a crowded frontcourt. The Bucks have a full roster with 15 players, so a move would have to be made before they could add Gortat. The most likely odd man out would be Isaiah Canaan, who is on a 10-day contract. For the first time since returning from an Achilles injury, Warriors center DeMarcus Cousins will be playing without a minutes restriction, according to Nick Friedell of ESPN. Cousins is averaging 23.4 minutes per night in 11 games and has rarely played more than 25 minutes. Coach Steve Kerr said game flow will determine how long Cousins is actually on the court, but there are no more medical restrictions. He added that the plan was always to ease Cousins back into action for a month or so before unleashing him for full-time duty. The upcoming free agent has posted 13.9 PPG and 6.8 RPG in his limited playing time. Two-way player Damion Lee appears to be the favorite to fill the 15th roster spot before the playoffs, according to Anthony Slater of The Athletic. The Warriors haven’t given up on Bulls center Robin Lopez, but he won’t be playoff eligible if he’s not bought out before March 1. Another center, such as ex-Clipper Marcin Gortat, is possible, but Slater states that Damian Jones could recover from a pectoral tear by May, which would provide backup help in the middle. The Suns‘ buyout with Tyson Chandler would have helped the team much more if it had occurred during the preseason, tweets salary cap expert Albert Nahmad. The parties have reportedly had a standing deal on a buyout in place for some time, but Chandler was reluctant to commit until he was confident that another organization would pick him up. The consensus is the Lakers will be his next team. The money saved through Chandler’s buyout could have benefited the Suns in a number of ways, Nahmad notes. De’Anthony Melton, a second-round pick acquired in a trade with the Rockets, was limited to a two-year, minimum-salary deal because Phoenix didn’t have money available for a three- or four-year offer (Twitter link). Nahmad is assuming Chandler will give back about $452K in his buyout, and notes that the Suns waited until just before the start of training camp to sign Melton in the hopes that they could free up more cash. Unloading Chandler earlier would have also opened a roster spot and would have eliminated the need to waive Davon Reed when Jamal Crawford was signed (Twitter link). Reed, who is now on a two-way deal with the Pacers, is still owed his entire $1.4MM salary from the Suns. The news about Chandler explains why Richaun Holmes was the Suns‘ first choice at backup center in Friday’s game, tweets Gina Mizell of The Athletic. Holmes, who was acquired from the Sixers in an offseason trade, played a season-high 13 minutes. DeMarcus Cousins is expected to have a one-year stay with the Warriors, but GM Bob Myers isn’t giving up on the idea of extending their arrangement, relays Chelsea Howard of The Sporting News. During a recent appearance on the team’s pre-game show, Myers said “options are open” when it comes to keeping the All-Star center. “These type of predictions — good or bad — are pretty fruitless because you just don’t know,” he said. “You don’t know what’s going to be going on on July 1, 2019. You don’t know if it’s going to be better than you think … but it’s not going to be what you think. So, with a guy like DeMarcus, who knows? If he wants to come back, let’s bring him back.” If Kevin Durant and Klay Thompson both re-sign, Golden State would be well above the cap and would be limited to offering Cousins its mid-level exception again. Clippers center Marcin Gortat re-tweeted a message bemoaning the end of his consecutive games streak. L.A. traded for Gortat in June to help offset the expected loss of DeAndre Jordan, but he has averaged just 3.6 PPG and 3.9 RPG and is losing minutes to Montrezl Harrell and Boban Marjanovic. The Wolves will not tender Marcus Georges-Hunt a qualifying offer, Michael Scotto of The Atlantic tweets. Georges-Hunt, who played in 42 games for Minnesota last season, will be an unrestricted free agent this summer. Glenn Robinson, who will hit the unrestricted free agent market, has changed representatives, leaving CAA and signing with a group of independent agents. He’ll be represented by the team of Jelani Floyd, Daniel Poneman, Mike Naiditch, and E.J. Kusnyer, according to Kevin O’ Connor of the Ringer (Twitter link). NBA.com’s David Aldridge isn’t surprised that the Wizards dealt Gortat, tweeting that Gortat and Wall were “oil and water.” The scribe adds that Washington is now in need of a big man and he speculates that Nerlens Noel could be a fit in D.C. The Kings like Aaron Gordon, but view him as a power forward, the same position as Marvin Bagley, their top selection in this year’s draft, James Ham of NBC Sports writes. Ham adds that it’s unlikely Sacramento chases the 22-year-old. 10:29pm: Both teams have now officially announced the trade. 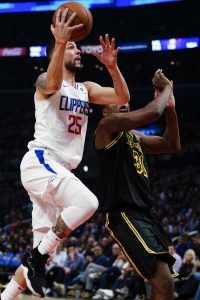 6:29pm: The Clippers are trading guard Austin Rivers to the Wizards in exchange for center Marcin Gortat, reports Adrian Wojnarowski of ESPN, making it perhaps even more likely that center DeAndre Jordan is on his way out of L.A. It was reported earlier today that Jordan, who has yet to decide on his 2018/19 player option, is considering exercising his option in order to facilitate a trade to another team, a la former teammate Chris Paul last season. While nothing has been reported officially, it seems odd that the Clippers would trade for Gortat if they have any expectation of keeping Jordan in Los Angeles. After drafting Shai Gilgeous-Alexander and Jerome Robinson in the lottery last week, Rivers appears to be a casualty of the Clippers’ guard heavy roster moving forward, especially given his price tag of $12.65MM, which is approximately twice the amount that the Clippers will pay their two rookies combined. Meanwhile, it had already been reported that the Wizards were hoping to move on from Gortat. The Wizards needed a proven reserve guard to give John Wall and Bradley Beal some backup and, as detailed by Ohm Youngmisuk of ESPN, to move on from Gortat from a locker room standpoint. As was highly publicized, Gortat and Wall had an inconsistent relationship, culminating in a public social media spat last season. The Wizards now figure to enter the free agent period this weekend in search of a center. Ian Mahinmi and Jason Smith are currently under contract for next season. From a salary cap perspective, the salaries of Rivers and Gortat match nicely, with Gortat scheduled to make $13,565,218 next season, only $915,218 more than Rivers. Assuming the swap is made official before the new league year begins on Sunday, the Wizards will create a trade exception worth $957,609, the difference between the two players’ 2017/18 salaries. The Wizards will also save about $1.4MM in luxury tax penalties by taking on Rivers’ salary in exchange for Gortat’s, as noted by ESPN’s Bobby Marks. Both Rivers and Gortat are in the final year of contracts, and will become unrestricted free agents next summer. The Wizards are working to deal center Marcin Gortat, but are refusing to part with the No. 15 pick to make it happen, tweets Marc Stein of The New York Times. Teams to watch tonight, according to Stein, are the Mavericks, who have the cap space to take on Gortat, and the Trail Blazers, who have a trade exception that will cover his $13.57MM contract for next season (Twitter link). Stein adds that many more clubs will have the cap space to fit Gortat if a verbal agreement is reached on a deal that won’t be finalized until July. It’s not the first time Gortat’s name has come up on the trade market, as Washington tried to work out a deal at the February deadline. Gortat has expressed dissatisfaction with his role in the past, and a mini-controversy emerged this winter when Gortat tweeted about a great “team” victory while star guard John Wall was sidelined after knee surgery. A source close to Gortat told Ben Mehic of The Step Back there’s “a good chance” the center will be traded soon (Twitter link), adding that both sides believe it’s time for “an amicable divorce.” The Mavericks signed Gortat to an offer sheet in 2009 and may still have some interest, Mehic notes (Twitter link). Gortat has been a steady part of the Wizards’ foundation for the past five years, missing just eight games since arriving in Washington in 2013. He played all 82 games this season, averaging 8.4 points and 7.6 rebounds per night.